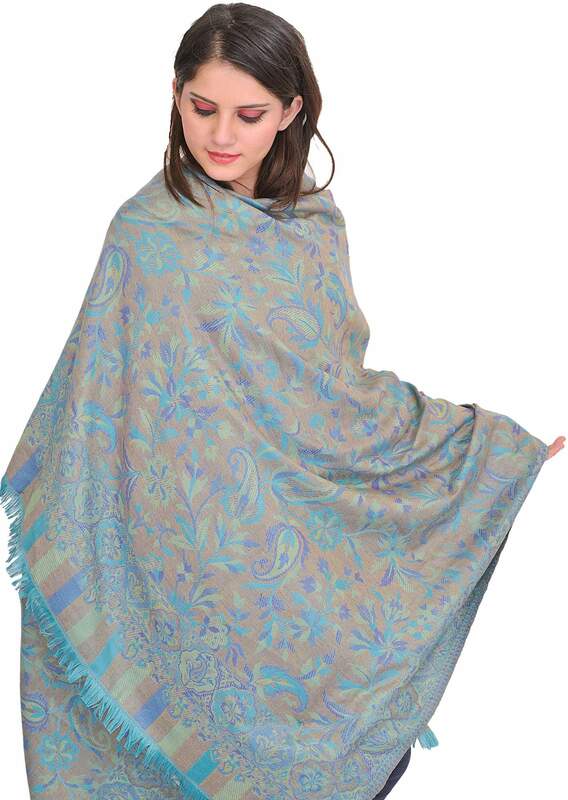 This shawl has been crafted of blended wool, of around 40 to 50 micron diameter. For strength and luster this piece blends a bit of acrylic thread with the result that in effulgence, gorgeousness and look it acquires rare distinction. Such rare distinction that it inherits from the material used in it apart, it discovers its beauty in its very concept – colour scheme and dimensions of design-motifs, more especially in the brilliantly woven design-patterns that embellish the entire field, the ends of the length and borders on both sides being differently patterned. The background colour and the colours of the design motifs have been amicably matched which affords to the whole piece tremendous unity and such elegance as is rarely seen in a cloth-piece. Though not very regular, a repeat of octagonal medallions adorns the edges of the length – the borders, and the end-parts – pallus. These medallions contain alternately two differently composed design-patterns that keep alternating though their colour scheme is the same for both motifs, or rather for all designing patterns used either for embellishing the field or the edges. The colours used in laying these patterns have a look of Victorian Europe, the piece is rare in ethnicity and indigenous flavor. One of the patterns in medallion is a conventionalized flower while the other consists of some kind of graphic formation usually a paisley-like form flower-like rising over a pair of leaves that a tiny branch supports. All three combined – the pair of leaves and paisley flower, create a trefoil like effect – a well known pattern used in decorative art. The patterns with which the field has been embellished consist of vines-like curving shoots of flowering plants carrying on each branch a bunch of leaves and flowers. All forms are largely conventionalized though quite communicative and straight. They all are broadly laid but each neat and precise primary emphasis being on their fascinating and eye-pleasing aspect. In its simplicity and look the ensemble is divine, and in its feel it has a fawn’s tenderness.